It’s only since I began researching my family history that I’ve been able to get to the roots of this story. Jacob Winter Greenland was born on 27 July 1831 in Folkestone, Kent. His parents were George Fearn Greenland (1788-1866) and Ann Winter (1798-1854) and he was the youngest of five siblings: Jane (1821-1891), Mary Ann (1823-? ), George (1825-?) and Hannah (1828-?). In the 1841 Census he was 9 years old and living with his mother Ann  and sister Mary Ann  in Back Street, Folkestone. Some fascinating details about Jacob are revealed in his Merchant Navy Seaman’s record, which was issued to him at Dover on 18 May, 1845 when he was just 13 years old. It records that the young man was 5 feet 2 inches tall, with brown hair, hazel eyes and a dark complexion. Under ‘Distinguishing Marks’ we are told he was ‘pitted with Small Pox’. On 3 May 1859 Jacob married Mary Ann Kemp at St Mary’s Church, Dover. Mary Ann was born in 1836 in Rodmersham, near Sittingbourne in Kent. According to the Census of 1861, Jacob was 29 and a Mariner and Mary Ann was 24. They had now moved to Dover and were living in Seven Star Street, part of the Pier District of the town. Their first child – a daughter named Jane Priscilla – was christened on 30 July 1861, but only lived a few weeks. Records show the infant Jane was buried on 14 August the same year. Sadly, Mary herself died in early 1864, aged just 28 years old. 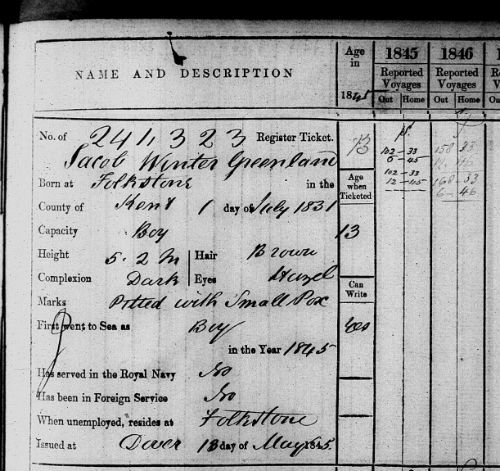 Records show that Jacob married again on 12 January 1865, to Mary Ann Mayne, who was born in Stonehouse, Devon in 1836. Their first child – a son they named Jacob Winter Greenland was christened on 3 February 1867; however he died a few months later and was buried on 12 May that year. There is no record of Jacob Greenland and his family in the 1871 Census, but by the time of the 1881 Census Jacob Mary were living at 3 Round Tower Lane in the Pier District of Dover and had four children: Jane (b1868), Elizabeth Ada (b1869), Anne (b1872) and John Jacob (b1873). Intriguingly the 1881 Census and 1901 Census returns show that John was born in Tipton in Staffordshire, and his birth was registered in the Dudley district (which includes Tipton) . A few months after the 1881 Census was taken, Jacob’s wife Mary Ann died and was buried on 13 October 1881. She was just 45 years old. So now his eldest daughter Jane (14) took over the running of the house, whilst Jacob earned the weekly wage. However, more tragedy was to strike as Jacob’s life was to be cut short due to an industrial accident just weeks after his 52nd birthday. A harbour employee named Jacob Greenland was drowned on Sunday morning near the Pier head, it being supposed that he fell in the water while on duty before daylight. On Monday an inquest was held at the George Hotel before S. Payn, Esq., Borough Coroner. Richard Mayne, a painter residing at Adrian Cottage, Adrian-street, deposed that the body at the dead-house was that of his brother-in-law, who had been in the employ of the Dover Harbour Board as a boatman. The deceased lived at 3, Round Tower-street and was about 52 years of age. The daughter of the deceased said she had lived with him and had charge of his house. She last saw her father alive about 11.30 on Saturday night, when he went home and said that he was going on duty at the Boomhouse. At that time the deceased seemed to be in his usual health, but he had been drinking, although he was not drunk. The deceased was not going to work when he left the house, but he was simply going to the Boomhouse, where he would lie down until 2.30am when he had to go on duty. He did this in order that he might be ready when called. Philip Marsh, a flagman in the employ of the Dover Harbour Board said he was on duty at the South Pierhead at 2.30am on Sunday morning. About that time witness went to the watchhouse on the pier to obtain his small hand lamp, and there saw the deceased. He appeared to be asleep, and witness did not wake him until he had been out to see the tide-gates. Almost immediately he returned to the watchhouse, however, roused the deceased, and told him it was time to go over and put the North Pier light up. He replied that he had no matches, but subsequently the deceased went to the Custom House officer of the watch at the Boomhouse, where he obtained what he wanted. The deceased then went away towards the ferry ladder to get a boat and witness went to the South Pier to put the south light up. The deceased appeared to be perfectly sober. The Witness considered the ladder down which the deceased had to go down to get into the boat was rather dangerous. The rails did not reach to the top of the quay, and they were very slippery. A man named Bowles ought to have been on the North Pier with the deceased to help him put the light up, but the witness did not see him. Subsequently at 4.30am one of the Harbour Board men named Smith came to the witness, and asked whether he had seen or heard anything of Greenland. The Witness replied, “Yes, I saw him go away from here when he went to put the North Pier Light up”. The Witness supposed that Bowles, thinking the deceased had forgotten to do his duty, went and put the light up in his stead. Subsequently Bowles went and looked for the deceased in every direction, and with the assistance of the ferryman set to work grappling for him. He picked the body up by the ferry steps shortly before eight o’clock on Sunday morning, and conveyed it to the deadhouse. Jeremiah Enright, Customs House Officer, Dover, said at 2.30am on Sunday morning the deceased came to him for some matches, as he was going to light the lamps on the North Pier. The deceased was quite sober. Witness gave him some matches. Saw the deceased light his pipe, and then he went away and heard nothing more of him. Mr Clement Walter, police surgeon, said he was called to the deadhouse on Monday morning. There he saw the body of the deceased, examined it, but found no marks of violence as far as he could see, and his opinion was that the deceased died from suffocation from drowning. The jury returned a verdict of ‘Found drowned’. On a final note, Jacob and his wife Mary Ann were buried in St Mary’s Cemetery, Dover in an unmarked grave. It was only in May 2007 that the graves of Joseph and Elizabeth were marked by a simple wooden cross by their 2xGreat Grandson, Anthony Pile and his wife Jane. Cross marking the graves of Jacob and Mary Ann Greenland. So, what became of Jacob and Mary Ann’s children after their parents’ untimely deaths? Elizabeth Ada Greenland (1869-1964) was just thirteen when her father died. By the time of the 1891 Census she was working as a servant at 205 London Road, Dover, for Annie Bonham, a Grenada-born British subject, and her two daughters. In 1895 she married Alfred Thomas Willis (my great grandfather) and in the 1901 Census they were living at 59 Oxenden Street, Dover, with daughter Annie Louise and adopted son William Edward Button. Elizabeth was already pregnant and gave birth later the same year and called her son Alfred Thomas (1901-1967), after his father. Annie Louise sadly died later in 1901, aged just 3 years old. By the time of the 1911 Census Alfred and Elizabeth had five children: William , Alfred , Charlie , Edith  and my grandfather, George . The family were living at Julian Cottages, New Hythe Lane in Aylesford, Kent. Alfred was a Gateman with the South East & Central Railway company (SE&C), William was working in a papermill. Elizabeth died in 1964, aged 95 years old. Annie Greenland (b1872) was eleven years old at the time of her father’s death. In the 1891 Census she was twenty years old and living at 8 Darley Place, Folkestone with her cousin, George Greenland, his wife, three children and one servant. In 1899 she married Alfred Blackman in Dover. In the 1901 Census Alfred was a Lamp Lighter and he and Annie were living at 27 Dickson Road, Dover. By the 1911 Census Alfred and Annie had four children: Henrietta (b1901), Alice Edith (b1903), Alfred Edward (b1907) and Jane Eileen (b1908) and their address was 16 Devonshire Road, Dover. Their fourth child, Charles was born in 1912. John Jacob Greenland (b1873) was just 10 years old when his father died. There appears to be no record of him in the 1891 Census, but we do know that he married Grace Isobel Croot in 1898 in Dover he was twenty five. In the 1901 Census he is living at 143Clarendon Road, Dover and his occupation is listed as ‘Seaman’. The following year, on 7 February 1902, John and Grace had a daughter, whom they named Mabel Grace. According to her Birth Certificate, John’s occupation was ‘Mariner, Packet Service’, and they were still residing at 143 Clarendon Road. In the 1911 Census John was serving as First Mate aboard the Calais, moored in Calais Harbour. John’s wife, Mabel, died in early 1915, and in 1917 he married Henrietta E Blackman, sister of Alfred Blackman (husband of John’s sister Annie and therefore also his sister-in-law!). Over forty years later, in 1955, John’s daughter, Mabel, married Charles Willis, the son of Elizabeth Greenland (above), and therefore her first cousin. Charles was a widower, having first married Minnie Blanks in Chelmsford in 1928.